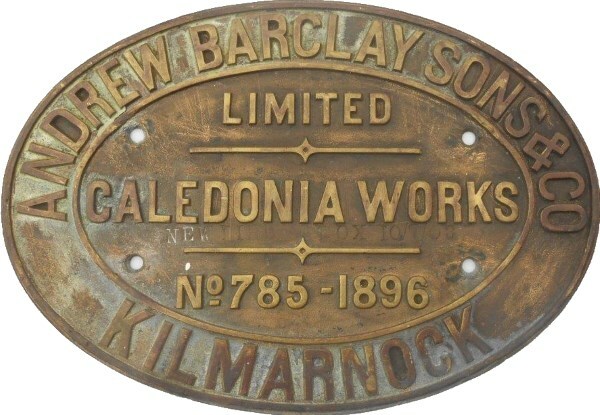 Lot 42 Brass Oval Steam locomotive Worksplate "ANDREW BARCLAY SONS & CO LTD. CALEDONIA WORKS, KILMARNOCK. No 785 - 1896". As carried by a 0-4-0ST Loco. New to Fife Coal Co (No 13) at Mary Colliery, Loch Ore. Spent all its working Life there, then to Central Workshops, Cowdenbeath in 1950. Scrapped in 1953. Ex Loco condition.